TripAdvisor Travellers’ Choice Awards has published a list of the top 10 restaurants in Ireland. This was compiled on the basis of reviews left by users. This is considered a reliable assessment, especially where there a good number of reviews. 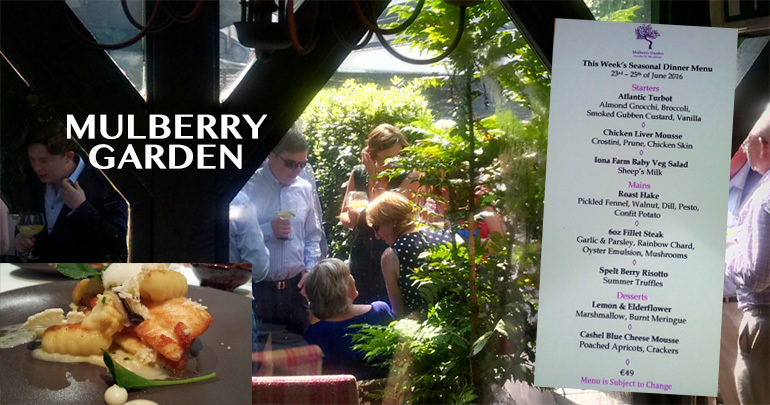 Mulberry Garden Restaurant in Donnybrook came out on top in Ireland. At the time of writing it has 413 reviews on TripAdvisor, of which 314 rate it Excellent and 48 rate it Very Good. Mulberry Garden prides itself in being a very Irish restaurant. The ambience has an Irish atmosphere and the equipment, cutlery and dishes are Irish where possible. And, of course, the menus are based on the best local ingredients of the day. Mains: Monkfish Cheeks, Wild Duck, Baked Celeriac. All those dishes are served with a variety of vegetables, sauces and side dishes.Sounds delicious! Three other Dublin Restaurants made it into TripAdvisors top 10. At No. 3 was Chapter One Restaurant which is one of the four Michelin Star Restaurants in Dublin. At No. 5 was Sabor Brazil in Canden Street. At No. 8 was Dax Restaurant, a French/Irish restaurant in Pembroke Street which has won many other awards also.